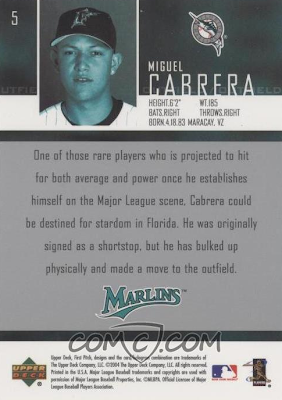 Born today, 2012 AL Triple Crown Winner, career 151 OPS+ hitter, and occasional glove man Miguel Cabrera. Miguel split 2003 between third base and left field, so I assume this photo shows him as an outfielder, fielding something hit low in front of him. 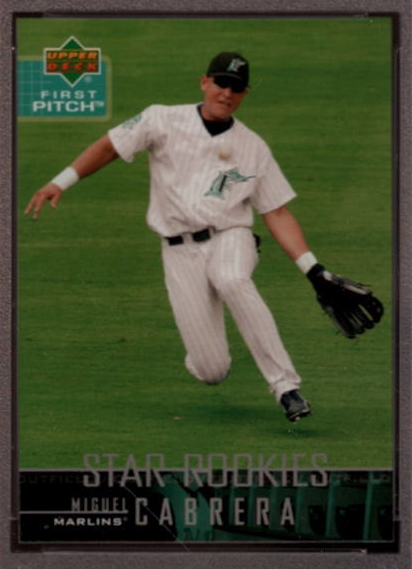 Upper Deck published this 300-card set to coincide with Opening Day, in part to get young guys like Cabrera shown in "real" uniforms as quickly as possible (set checklist). 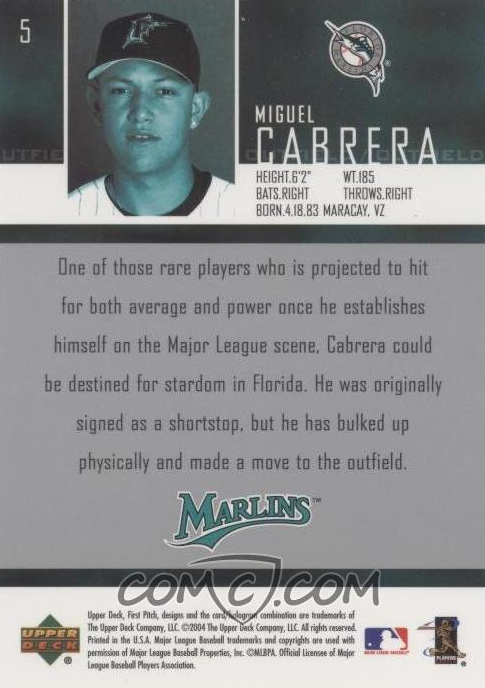 This card text actually undersells Cabrera, who certainly "bulked up physically" and can hit darn near everything within reach. "FUTURE TRIPLE CROWN WINNER" might've been tough to predict, though. Want a major flashback? Check out Florida's 2004 Opening Day roster, which still featured "original Marlin" Jeff Conine and future Red Sox title winners Josh Beckett and Mike Lowell. Yeah, I'm old now. Value: Awesome hitter or not, this #5 costs just $1 on COMC.com and other stars run about the same.